As I was a kid I used to think my mother was the best cook in the entire country. I eventually learned that there was a better cook than my mother. It was my aunt, “imo”. 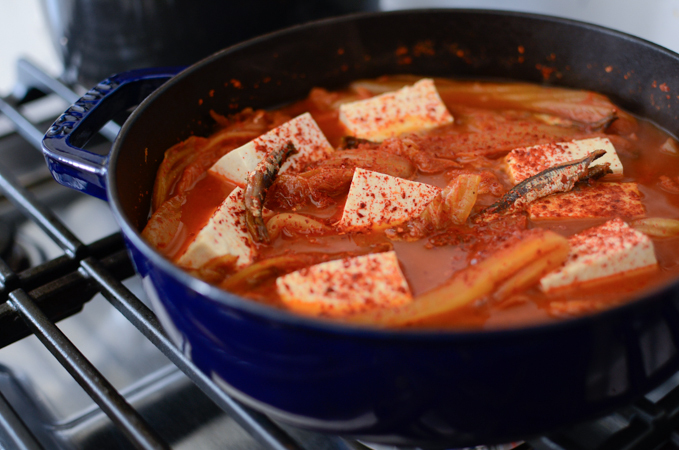 This anchovy kimchi stew (myulchi kimchi jjigae, 멸치김치찌개) recipe came from her. She was my mother’s older sister; 9 years older. She was very talented in cooking, sewing, quilting, needle work, crafting, and you name it. Her house was decorated with many of handmade crafts that she created. 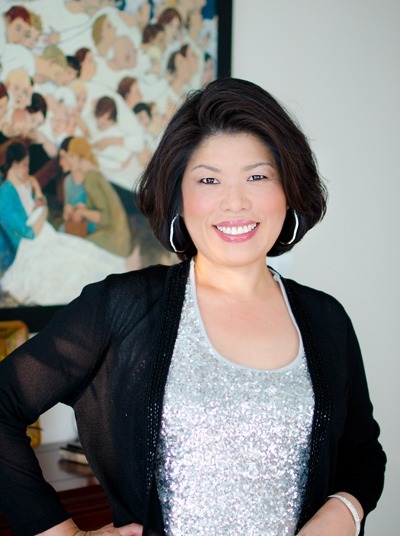 She was like the 80’s Korean version of Martha Stewart if I can describe her more correctly. I had a chance visiting her with my mother when I was about 14-15 yrs old. 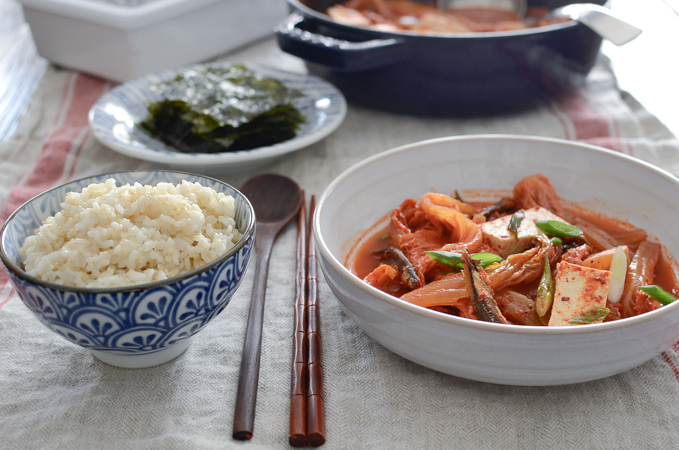 She made this anchovy kimchi stew and I still remember how much I enjoyed that day. 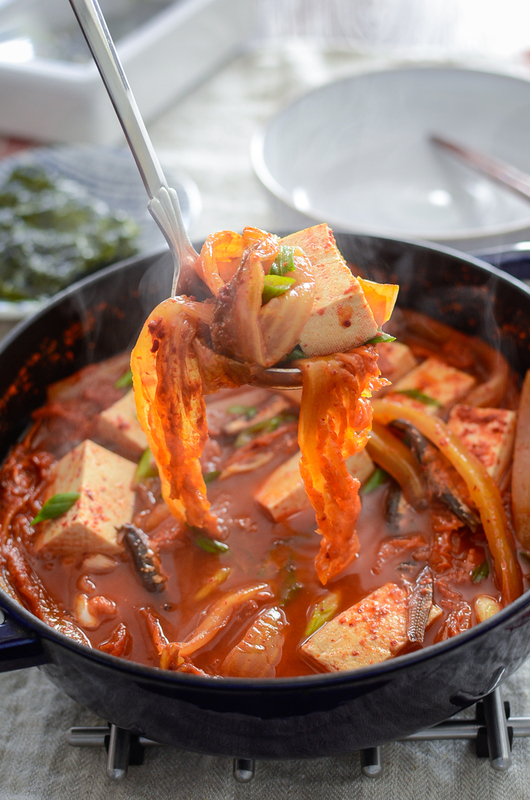 My mother also often made kimchi stew with dried anchovies since it is common to simmer extremely sour kimchi with dried anchovies in the southern part of South Korea. However my imo’s version was so much tastier. Sorry mom! Imo added the fragrant wild perilla oil mixed with non-fragrant oil in the stew to bring the depth to this homey comfort stew. She also simmered it for a long time, more than an hour. I loved it. 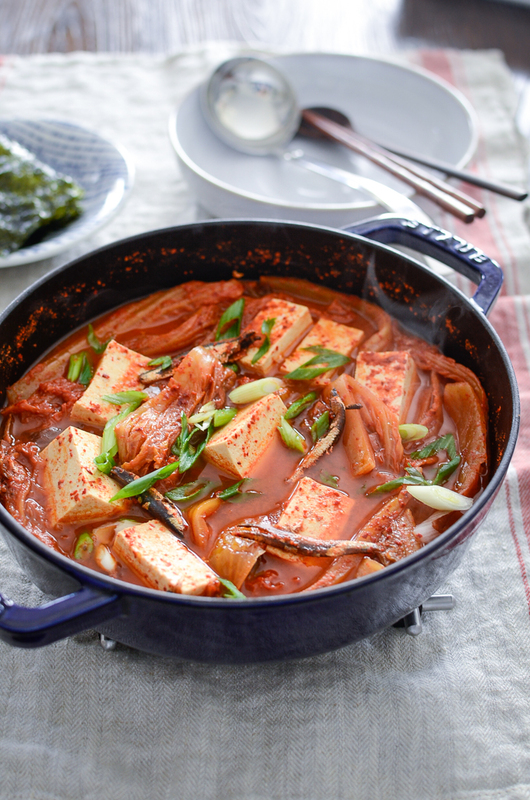 In fact I love her kimchi stew even better than the typical kimchi stew made with pork. This is a cherished family recipe that I would like to share with you. 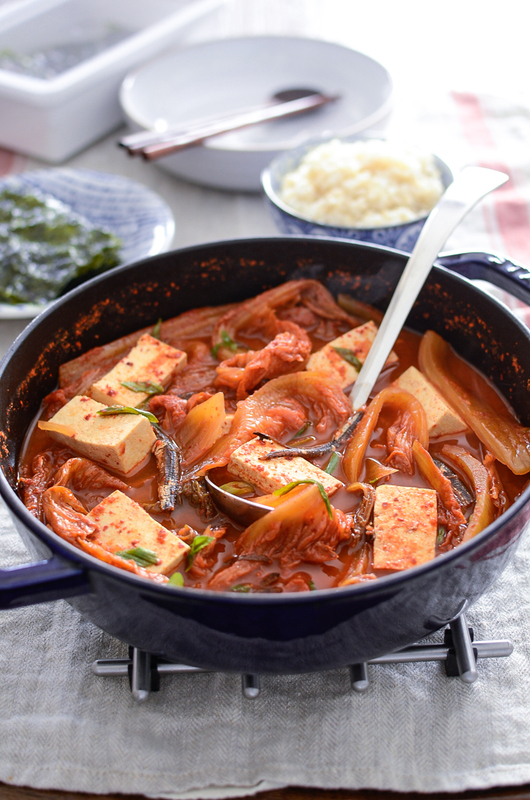 If you are kimchi stew (kimchi jjigae) lover, try it. You won’t regret. You will need to remove the head and the gunk of the dried anchovies, then toast them for 1-2 minutes. This will remove the fish smell. 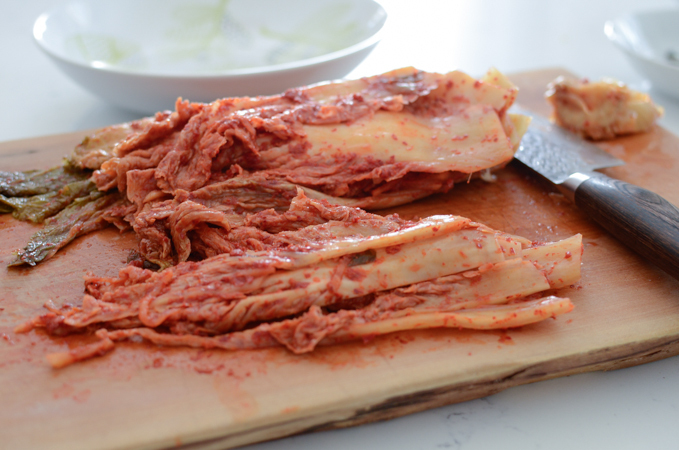 Use very sour cabbage kimchi. Mine was made about 6 months ago. Slice anyway you like. I like mine to have vertical length. These two oils are the key point of the stew. 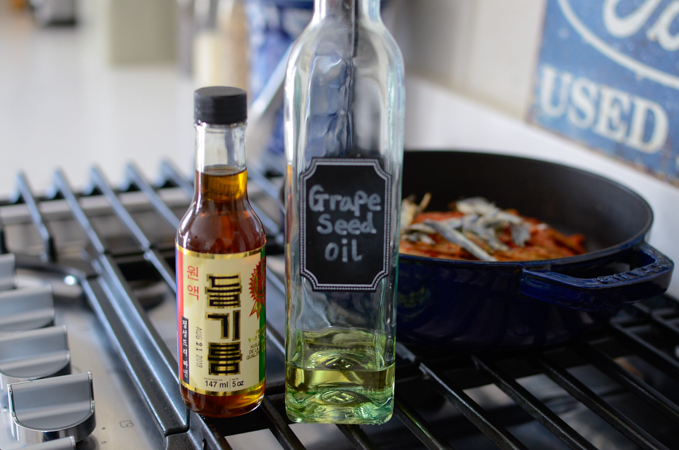 Wild perilla oil (deul-girum, 들기름) and grapeseed oil (or other non-fragrant oil). If you can’t find the perilla oil, replace with more grapeseed oil. DO NOT substitute with sesame oil, though. They are not same. 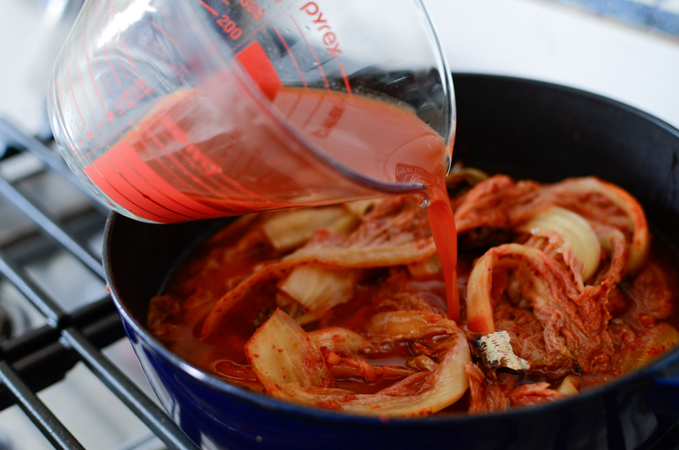 Toss kimchi, anchovies, and oils together in a stew pot. Add water, cover, and bring to a gentle boil. Turn the heat to low and simmer for 1 hour. 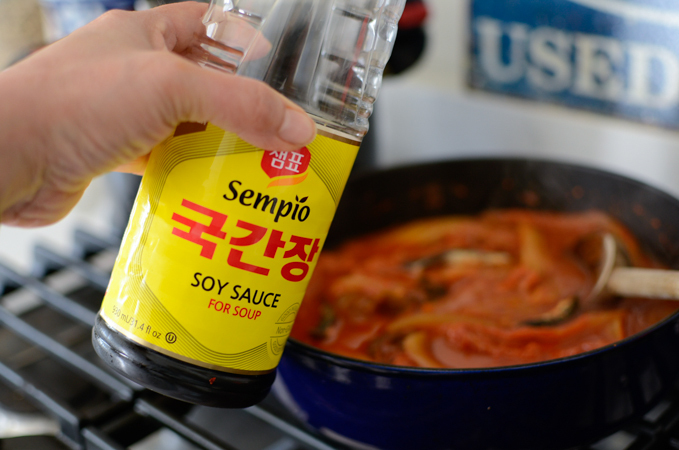 Season with Korean soy sauce for soup if needed. Add some chunks for tofu, if you like, and sprinkle a little bit of Koran chili flakes. Heat through for about 10 minutes or so. 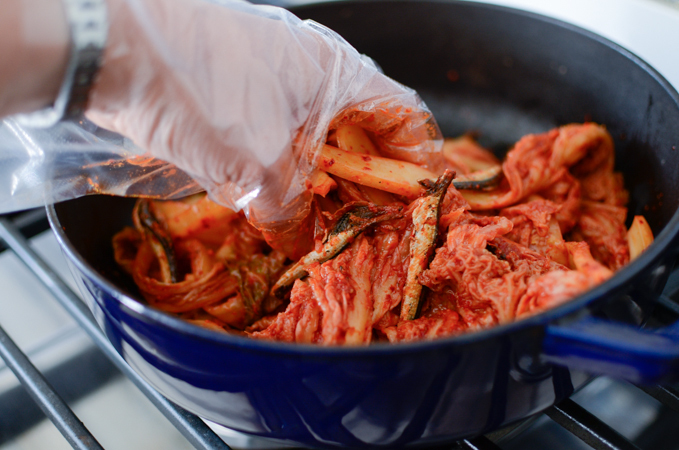 The long simmering of dried anchovies does harmonize with the sour kimchi. This stew is truly lovely. Serve with rice and roasted seaweed. The real southern style Korean meal will welcomes you home. 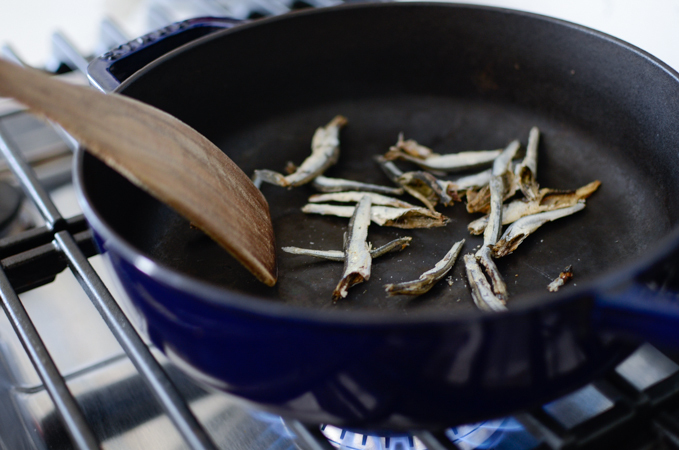 Toast the dried anchovies in a bare soup pot over med-high heat for 1-2 minutes. Add the kimchi and oils to the pot. Toss well to coat the kimchi and anchovies. Pour the kimchi juice and water. Add honey if your kimchi is extremely sour. Bring to a gentle boil, cover and reduce the heat to low. Simmer for 1 hour. Season the stew with Korean soy sauce for soup if needed. Add the tofu, if using, and Korena chili flakes. Stir and simmer another 10 minutes. Sprinkle the green onion and serve warm. The stew tastes even better on the next day. Such an interesting dish! 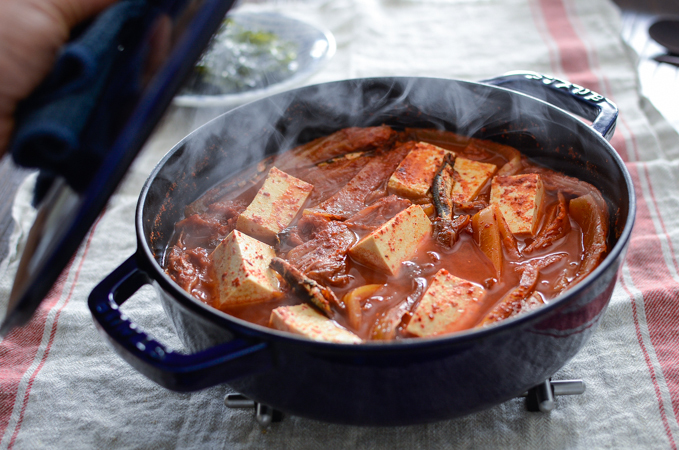 You know more ways to use kimchi than anyone! I love kimchi stew. I'm a bit surprised that your mom did not add perilla oil like your aunt. Did your aunt guard the recipe like a secret until later? I don't think my aunt guarded the recipe from her. My mother didn't use any of oil in her stew because she liked it that way. 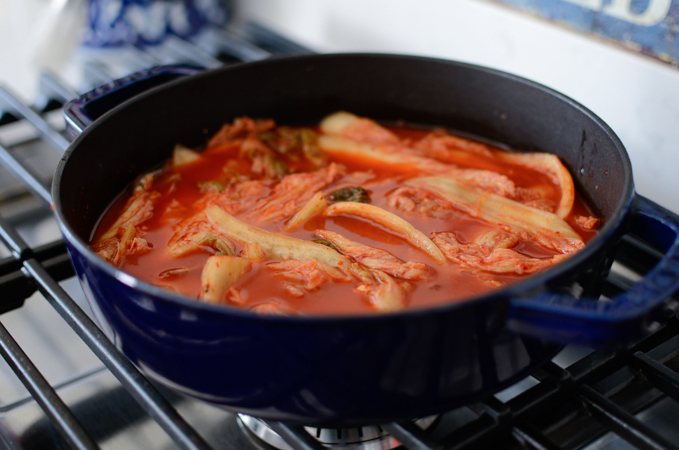 Adding the perilla oil in the kimchi stew was not common in the south, but not heard of either. Hi! Just made your recipe today, it was amazing! BTW, what is the stab pan you used? Seems like perfect for winter stews! Hi Daria Great to hear that your loved this stew. The pot I used is the Staub. I got it from William-Sonoma. I love it. 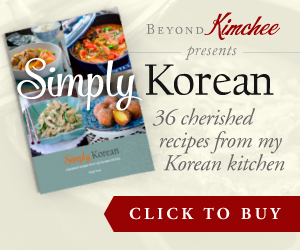 Perfect for Korean stews.